One of the weakest side of the la4j library - its documentation. I would really appreciate any help in this direction. It's not that difficult to fill the gaps in current documentation. It just requires some time and motivation on contribute to OSS project. So, if you folks, were always dreaming of OSS contribution - drop me the message @vkostyukov. We will work it out. Don't forget to update your Maven artefacts and feel free to touch me with feedbacks/questions at @vkostyukov! The la4j now almost ready for 0.4.5 release. All our current activities are dealing with testing. We want to make new version as stable as possible. For this we have already added 150 new tests and planning to add 50-100 more. Thus the new release will contain ~500-550 tests in total, which is the great progress according to the previous release. Traditionally, I would like to thank two guys: Yuriy Drozd (Kiev, Ukraine) and Maxim Samoylov (Saint-Petersburg, Russia) for being such an active and valuable contributors of la4j. These guys did a wonderful job to bring the la4j to current state. Yuriy has fixed a critical issue in 'swap' operation for sparse vectors and added a new decomposition support to la4j. Maxim joined the project two months ago and started working on stability of existing code. Hi has fixed a very important issue in Eigen dcompositor; added new interator (iterating through non-zero values, iterating through the values in row/column) methods to matrix class. Maxim has also spent tons of time evaluating double-rounding issues in la4j (in "rank" and "determinant" methods). So, Maxim now is the most active contributor, for sure. 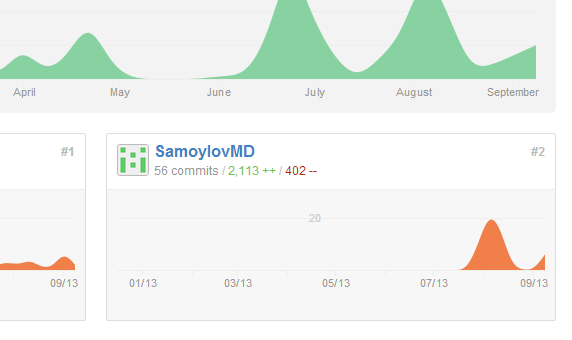 He made 56 commits (+2000 LOC) to repository and got the second place (right after me) in contributors list (see picture bellow). Thank you again, guys! I really appreciate your help! When I started the la4j project, I didn't think that it will be one of the most popular packages for Linear Algebra in Java. So, in two years the library changed a lot. And it continue changes from day to day. I'm so glad seeing people fixing bugs/proposing pull-request/sending feedbacks. Which means, that I need to make this library more and more awesome. And I have a plan to bring the la4j into the parallel world. This plan conststs of two major steps. First, I need to design a high-level idea of incapsulating the engine of the library, whcih knows how to deals with matrices and vectros in a more efficient way. The engine should use all the advantages of concreet matrix type and don't use its disadvantages. The simpliest example - do not iterate through zero elements in CRS/CCS matrices while computing something that doesn't require handling zero values. I hope, it can be done in realease 0.5.0 at this winter. And I believe that this version will show just incredible performance accoring to the 0.4.5, because all these optimizations with sparse matrices. But it is still wll be a single-threaded version of la4j's engine. Second, I'm planing to develop an additional implementation of engine, that will handles all tasks in parallel - a parallel engine. And I'm really exited about new features of Java's Fork-Join Framework. It just a perfect base/tool for solving this kind of tasks. So, A parallel engine will be avaliable at version 0.6.0 at next summer. The F-J Framework is an awesome and well-tuned cuncurrent framework for Java. And it allows to the developer use data-parallelism in his code. This is just perfect for matrix operations. PS: I'm planning to keep the la4j's API unchanged. This is my goal. If someone wants to participate in discussion the engine's design, go there.